Photo by Mark Lopez / Argonne National Laboratory. Scientists at the U.S. Department of Energy's Argonne National Laboratory have discovered a previously unknown phase in a class of superconductors called iron arsenides. This sheds light on a debate over the interactions between atoms and electrons that are responsible for their unusual superconductivity. "This new magnetic phase, which has never been observed before, could have significant implications for our understanding of unconventional superconductivity," said Ray Osborn, an Argonne physicist and coauthor on the paper. Superconductors are notably finicky; in order to get to the superconducting phase -- where electricity flows freely -- they need a lot of coddling. The iron arsenides the researchers studied are normally magnetic, but as you add sodium to the mix, the magnetism is suppressed and the materials eventually become superconducting below roughly -400 degrees Fahrenheit. Magnetic order also affects the atomic structure. At room temperature, the iron atoms sit on a square lattice, which has four-fold symmetry, but when cooled below the magnetic transition temperature, they distort to form a rectangular lattice, with only two-fold symmetry. This is sometimes called "nematic order." It was thought that this nematic order persists until the material becomes superconducting -- until this result. The Argonne team discovered a phase where the material returns to four-fold symmetry, rather than two-fold, close to the onset of superconductivity. "It is visible using neutron powder diffraction, which is exquisitely sensitive, but which you can only perform at this resolution in a very few places in the world," Osborn said. Neutron powder diffraction reveals both the locations of the atoms and the directions of their microscopic magnetic moments. The orbital explanation posits that electrons like to sit in particular d orbitals, driving the lattice into the nematic phase. Magnetic models, on the other hand (developed by study co-authors Ilya Eremin and Andrey Chubukov at the Institut für Theoretische Physik in Germany and the University of Wisconsin-Madison, respectively) suggest that magnetic interactions are what drive the two-fold symmetry -- and that they are the key to the superconductivity itself. Perhaps what binds the pairs of electrons together in iron arsenide superconductors is magnetism. 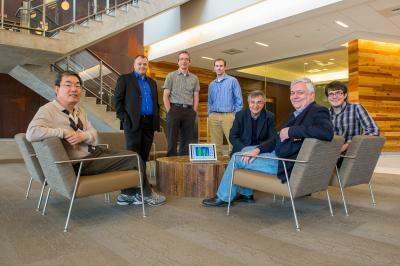 The paper, titled "Magnetically driven suppression of nematic order in an iron-based superconductor," was published in Nature Communications.